SKU: UVX S2500 Tags: Black Frame, Clear Lens, Construction, Equipment, Eye, Glasses/Goggles, Industrial, Manufacturing, Protection, Safety, Safety & Security, UVEX SAFETY, INC.
Safety glasses with scratch-resistant lenses. Fits over prescription glasses. Ultradura¨ hardcoated polycarbonate lenses, resist impact rays. 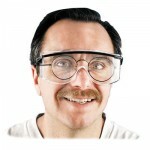 Easily fit over most prescription glasses and protect workers eyes from dangerous particles and chemicals. The scratch-resistant, Ultradura¨ hardcoated polycarbonate lenses resist impact and absorb 99.9% of harmful UV rays. Adjustable temple length allows various sizes to give you customized comfort.